If you have orders to Germany, Hawaii, or some other amazing overseas location, then you need to ship a vehicle. The military pays to ship one of your cars, but you will have to foot the bill for a second. You will likely be without your vehicle for two weeks either at your old base, or at your new base. I firmly believe you should go without at your old base to make sure your car is waiting for you when you arrive overseas. At your old base you can either a) borrow a car from a friend b) share rides from coworkers or c) get a rental car cheaper than one costs overseas. You need a car BAD when you arrive overseas. The military will likely put you in a hotel that is off base. You have to check into your new job. You have to look all over for a house. Even if you get a house on base, you will need a car. The wait for base housing is usually two weeks or more, and you will need a car during that time to get to work. But what about your sponsor? Yes, a sponsor can help you out and drive you around a bit. But honestly they’re not expecting to drive you around for 10 days straight. They have to go to work sometime. You need to hit the ground running, which means using all your time available in your first 10 days. You probably made many more friends at your last base that can help you while going without a vehicle. But you will know few people overseas initially. Bottom line: figure out how long it takes to ship your car and get it sailing early. You will ship your car through one of the many government VPCs. Overall, I think they do a great job. But they are strict on their rules! Make sure your car is clean, you have the right documentation, and have your gas tank filled to the right level. I’ve been through the VPC in Charleston four times. On almost every occasion I saw someone begging to be an exception to the rule. Just follow their instructions and the process is smooth! I would even call them before you leave and make sure you are prepared. The VPC will remove everything from your vehicle. Make sure you pack your important documents so they’re available when you arrive overseas. I failed to pack my insurance card and got a ticket for it when I was pulled over after arriving in Hawaii. The destination VPC is supposed to wash your car before you pick it up. But many do not have car wash facilities available and give you a voucher instead. Do not ignore this! You car traveled over open ocean and has been around a lot of salt water. You need to wash it quickly to get that crap off. I hope these tips were helpful! 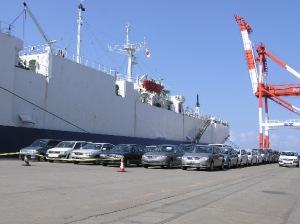 Stay tuned for the next article on this topic – shipping a second vehicle overseas commercially.